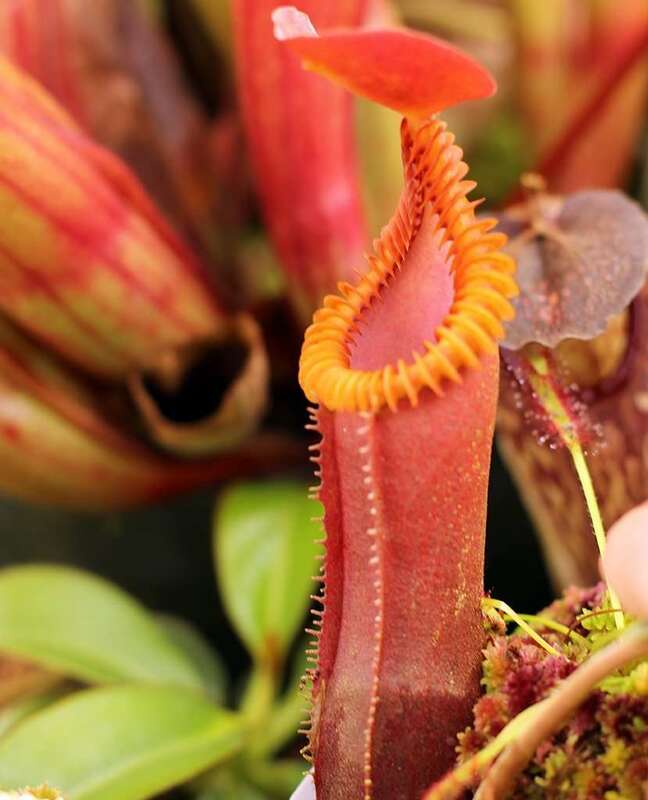 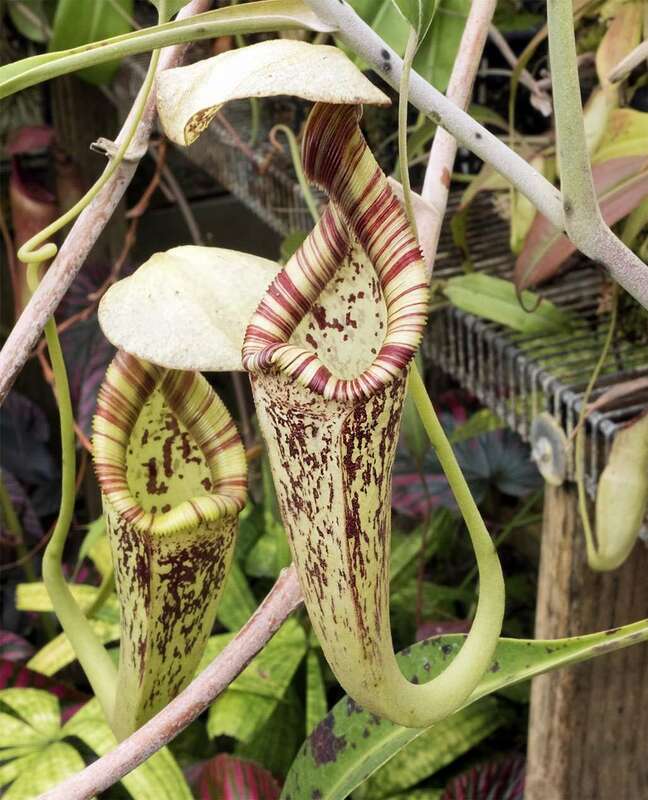 With knife-sharp hooks for a peristome, Nepenthes hamata is, hands-down, the most vicious looking tropical pitcher plant. 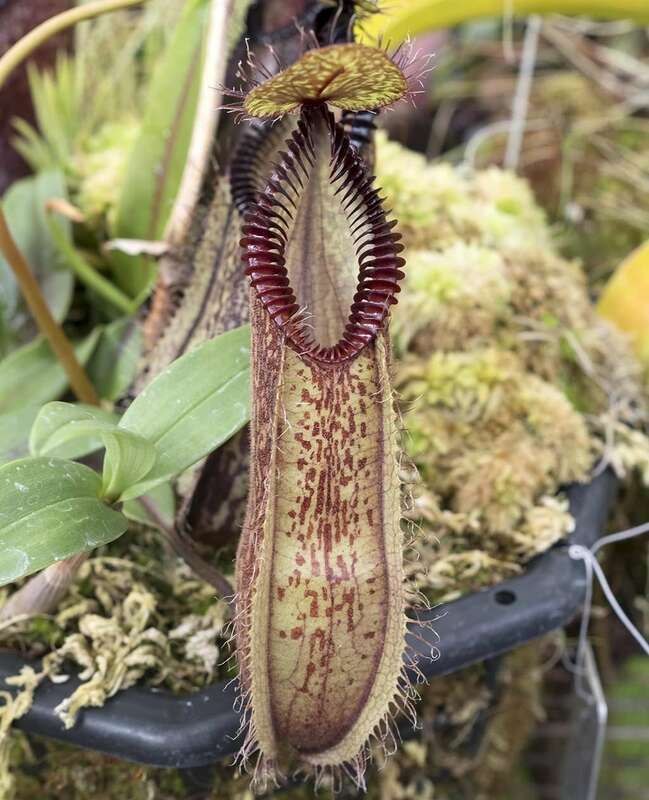 If I were an insect or small mammal, I’d refer to this as a Nope-enthes. 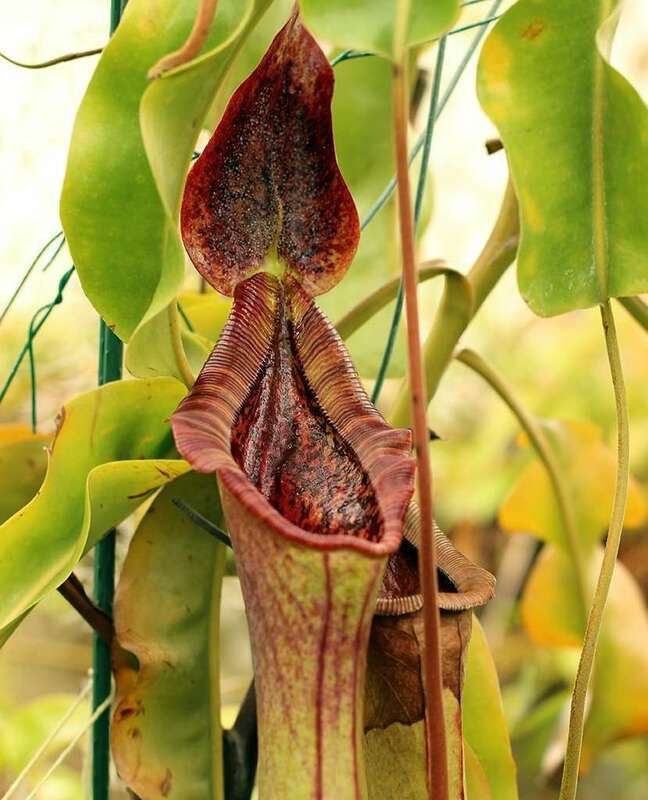 The name, hamata, comes from the Latin word hamatus, meaning “hooked.” Appropriate. 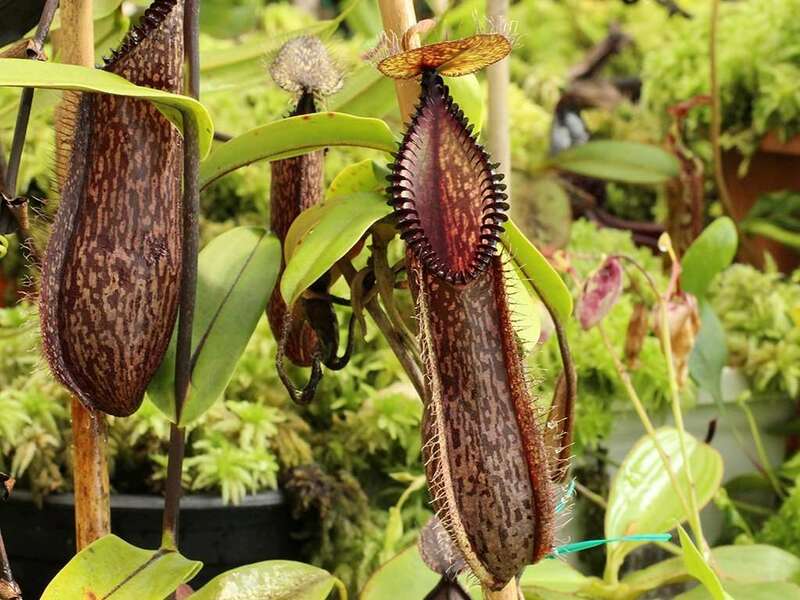 It’s a highland variety from Sulawesi, growing at elevations between 4600-8300 feet (1400-2500 m) above sea level where it strikes fear into the hearts of insects and small animals. 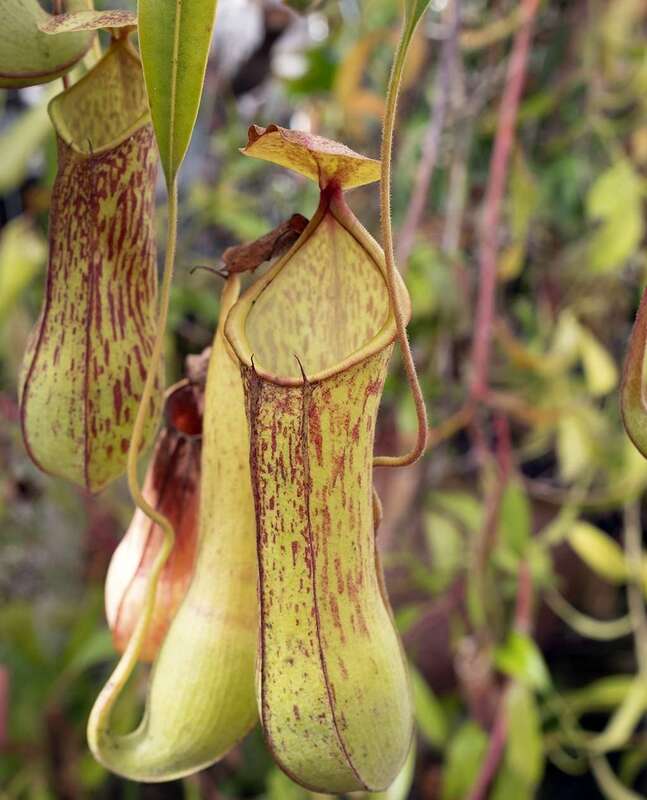 During my stay at the Herbarium Bogoriense in 1972, for the study of their Nepenthes collection, I was able to examine much undetermined material from several Indonesian islands. 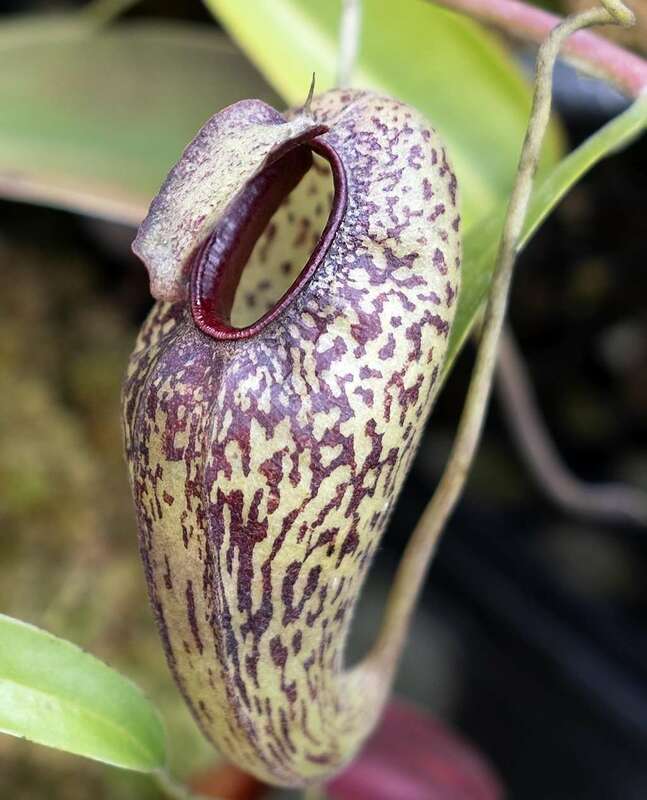 While going through those collected by P. J. Eyma in Sulawesi, I came across a very interesting Nepenthes. 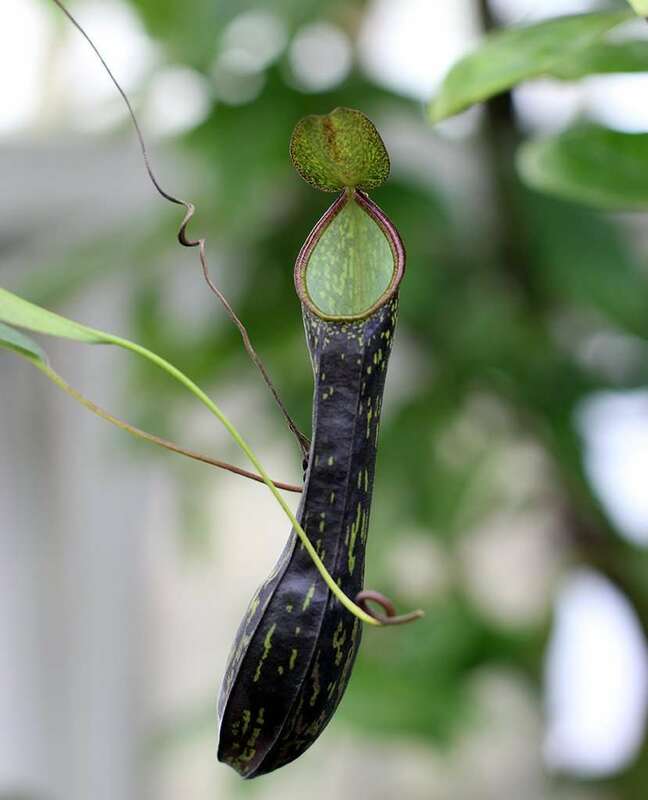 After subsequent study, I am now able to conclude that it should be described as a new species. 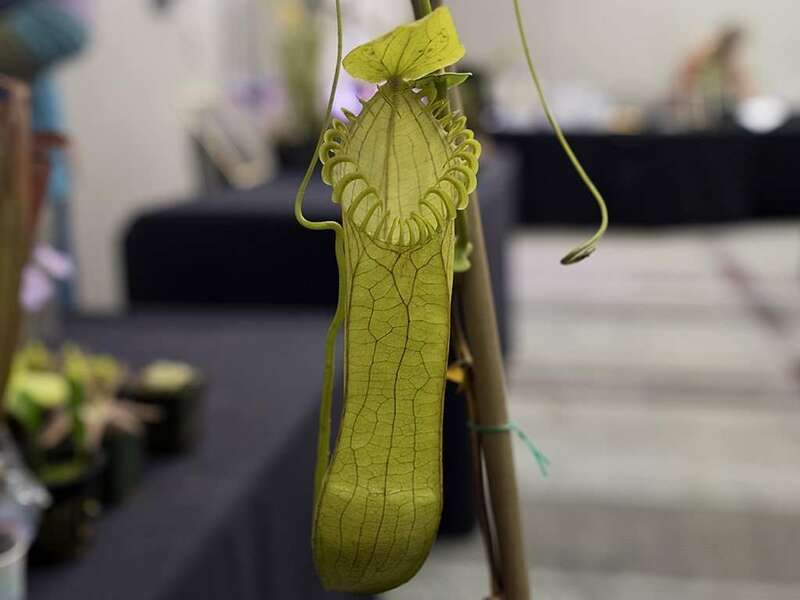 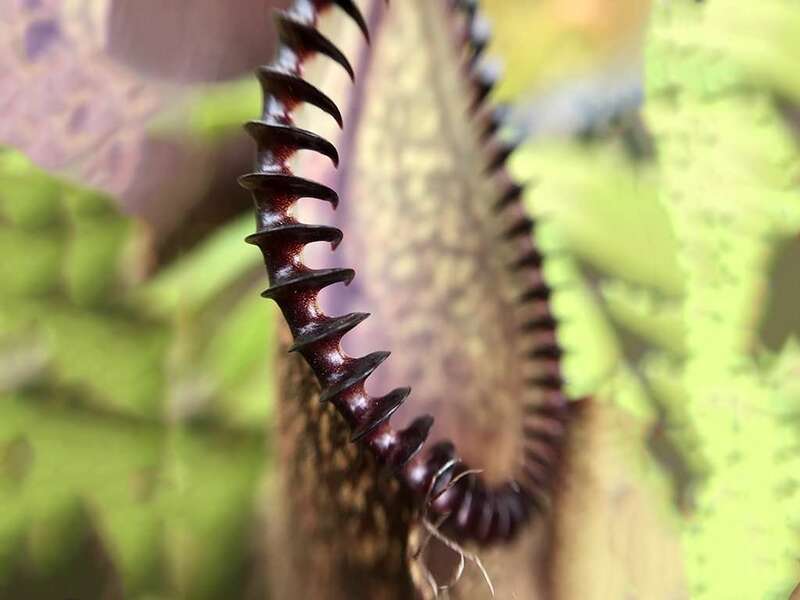 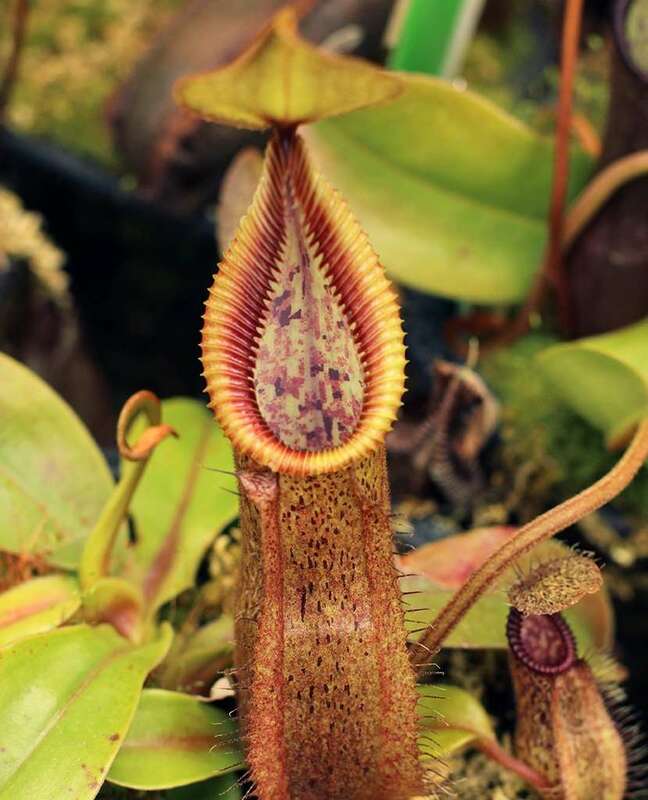 Kurata’s name, N. dentata, was first published in his 1976 book, Nepenthes of Mount Kinabalu, where he acknowledged its existence and yet noted it as “not yet established.” In the end, a feminized name (to reflect the female plant described) closer to Middleton and Turnbull’s N. hamatus won out, but let’s be honest – they’re both appropriate for this toothy monster of a tropical pitcher plant. 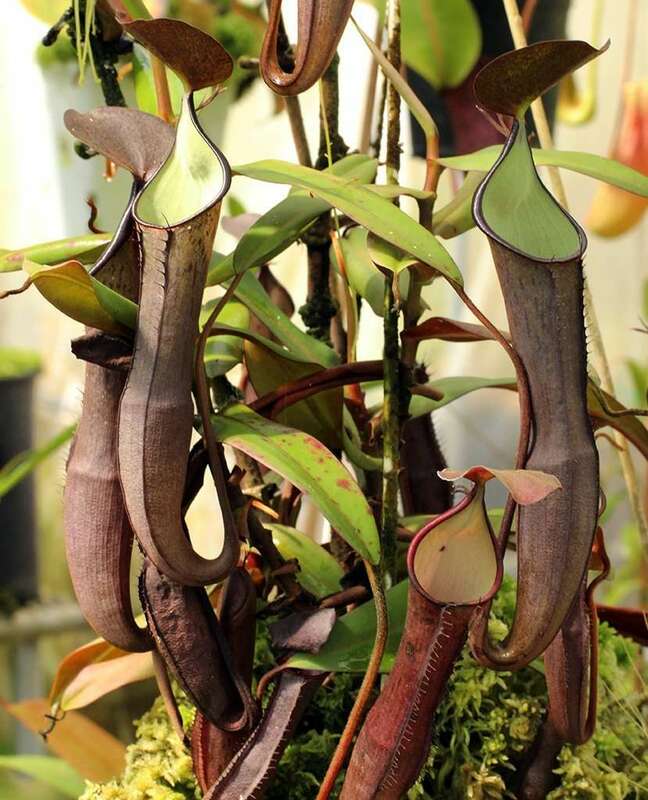 The most notable Nepenthes hamata characteristic is its wicked hooked peristome. 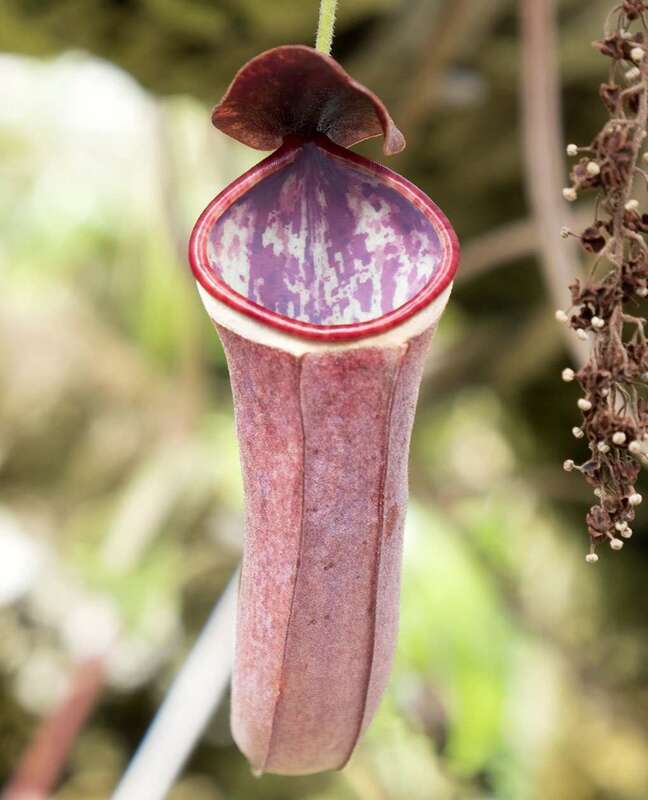 On lower pitchers, this peristome is a deep purple, as are the splotches on the body and pronounced wings. 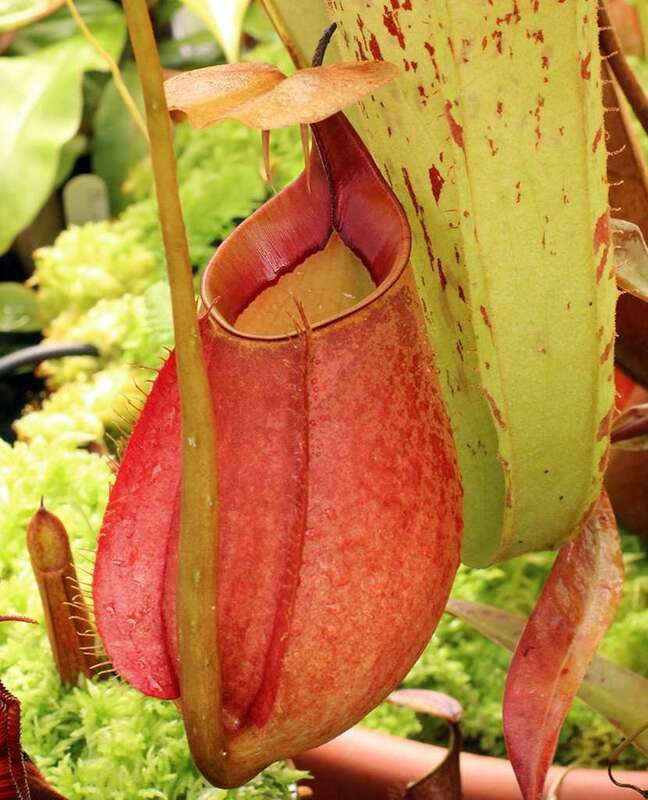 The lid frequently has distinct hairs on the skyward-facing surface. 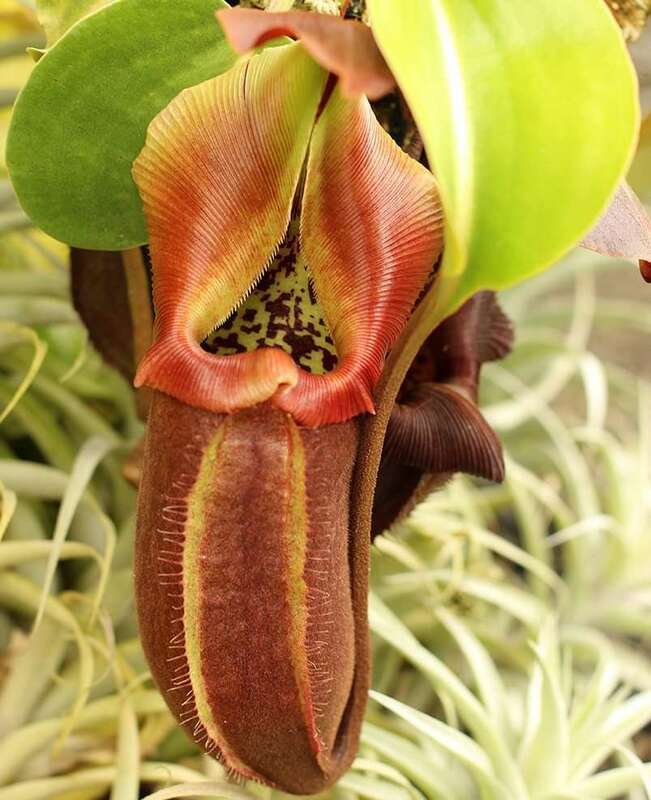 The peristome lightens on upper pitchers, often to a lime green hue. 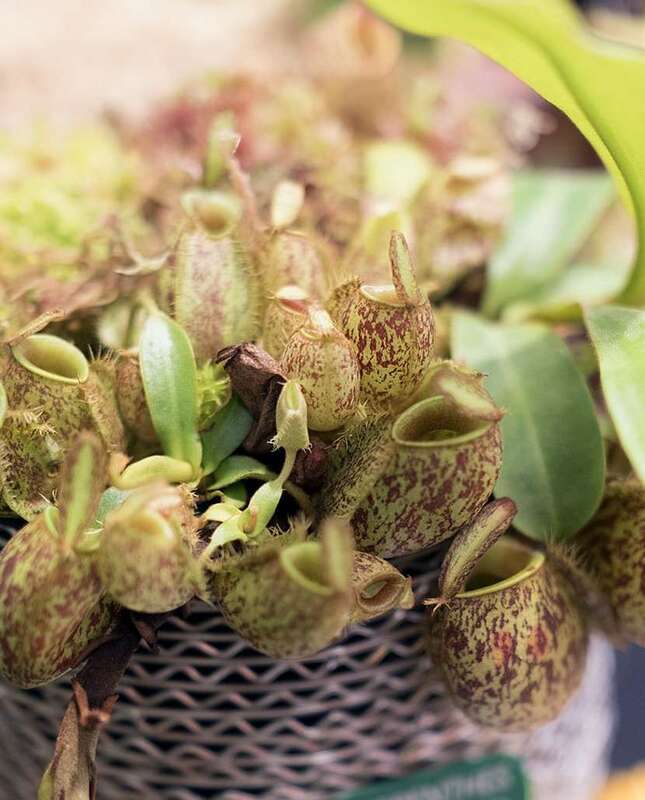 In some varieties, the pitcher body matches this lime green peristome, while in others, they remain splotched with red or purple marks. 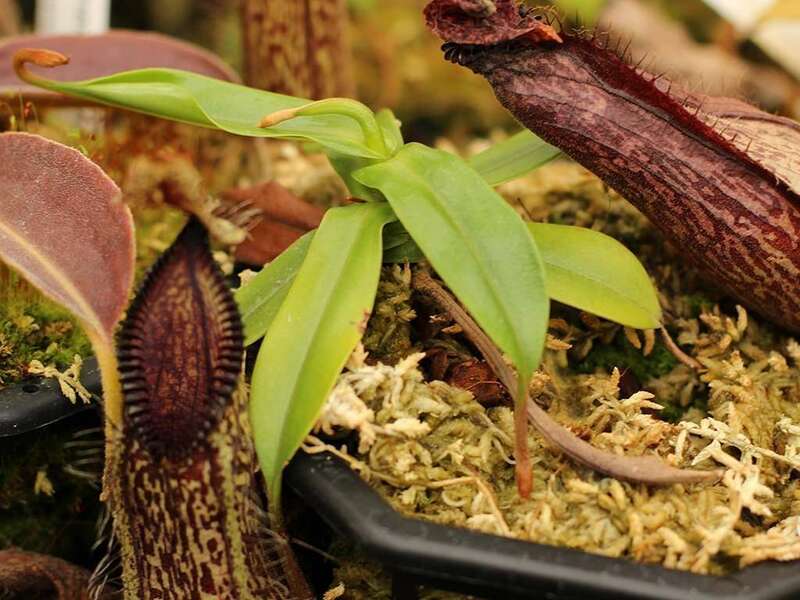 Coloration, it seems, is a bit variable. 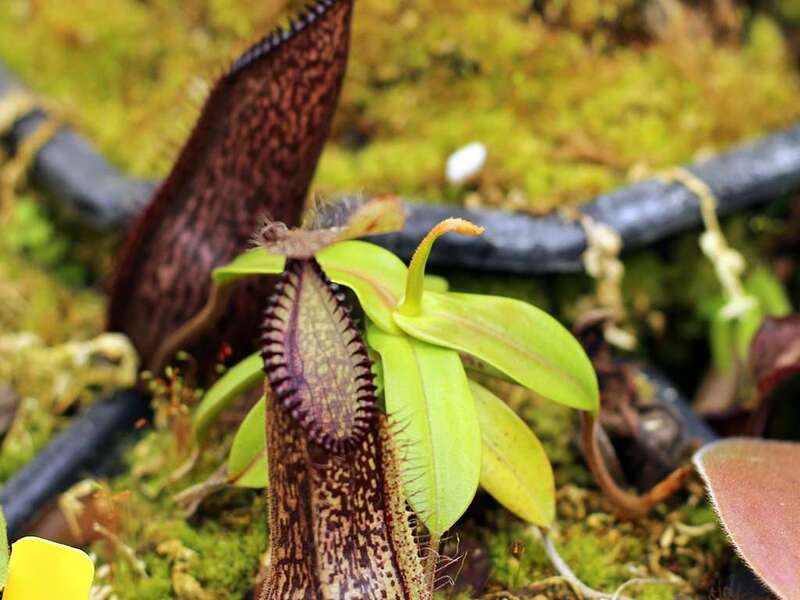 There’s even a species that is purplish-brown and fuzzy – like a cute, furry teddy bear that wants to gnaw your limbs off. 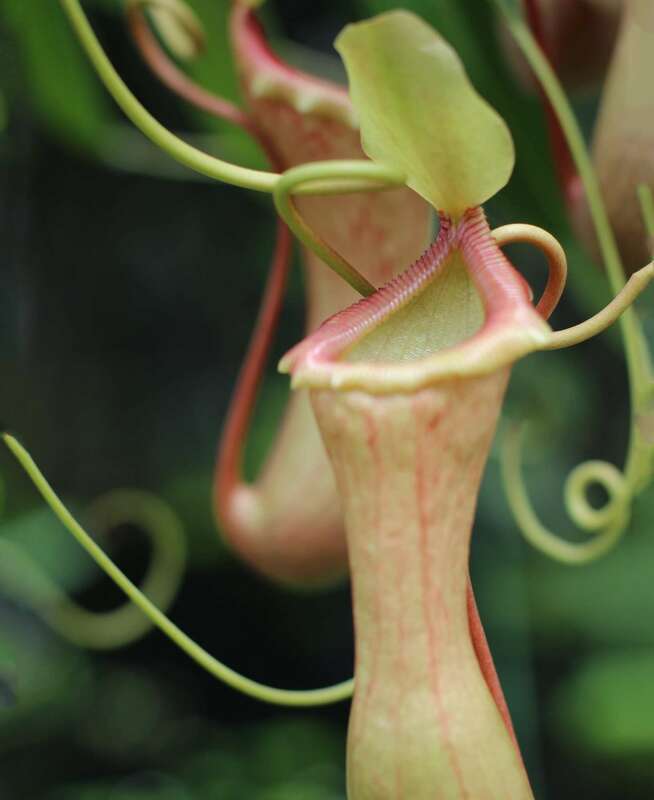 Upper pitchers lose those lower’s pronounced wings, replacing them with ribbing. 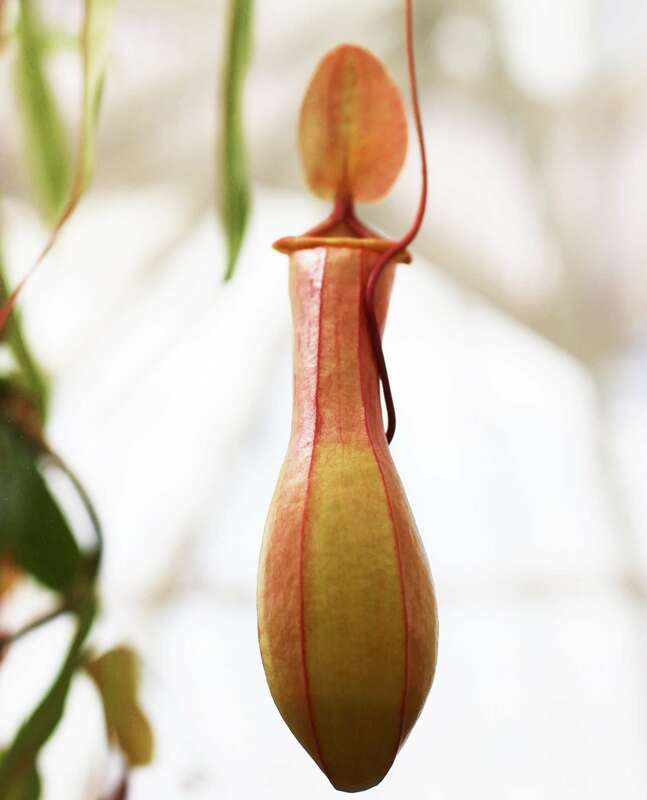 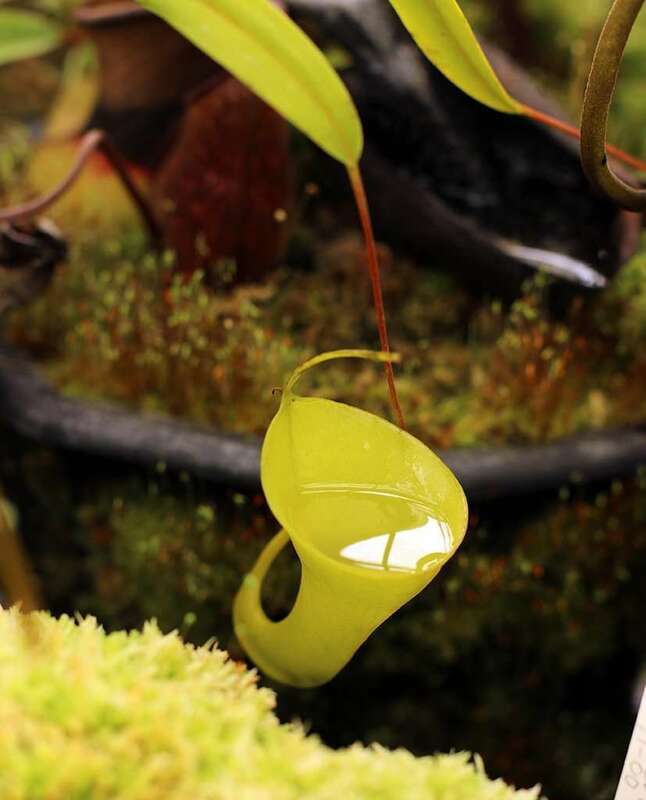 Lower pitchers on Nepenthes hamata are only produced for a short time before the plant transitions from a short rosette to a vining monster. 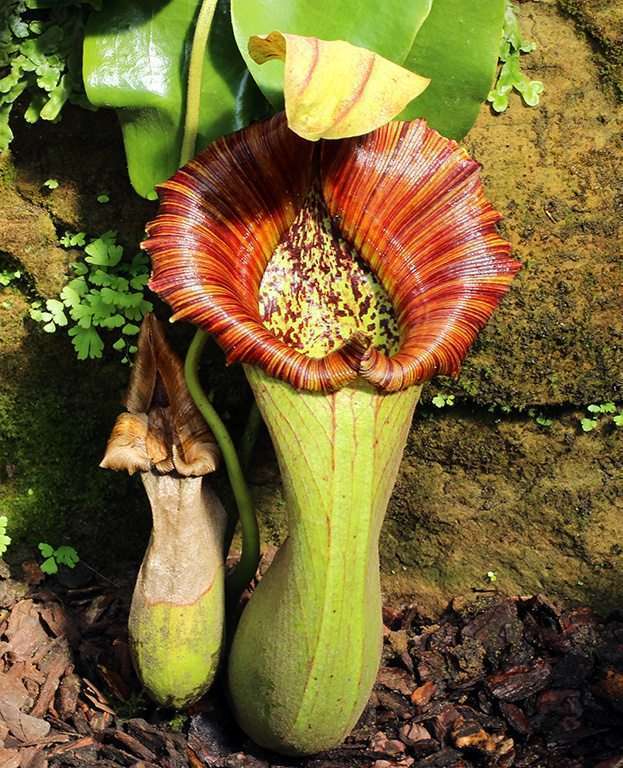 The stem generally tops out at about 23 feet (7 m). 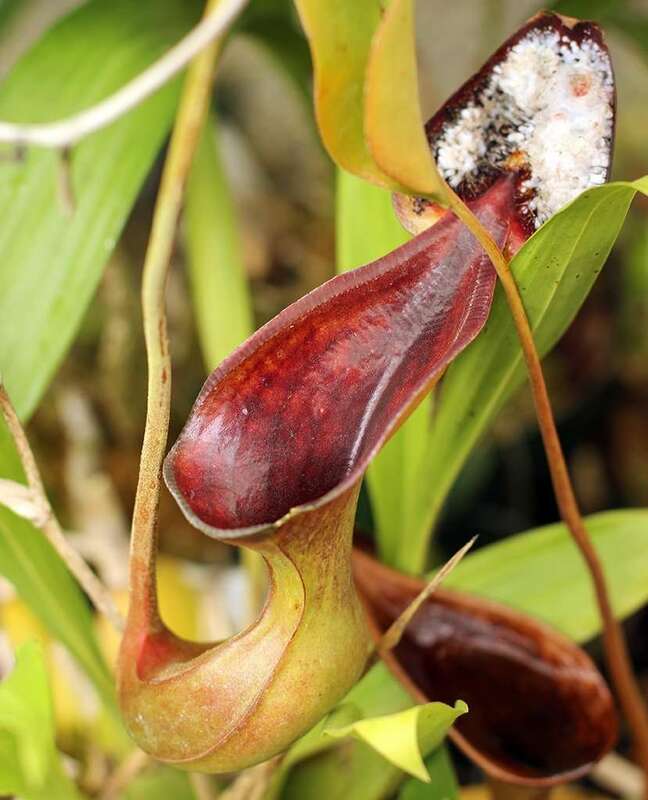 Basal offshoots are common. 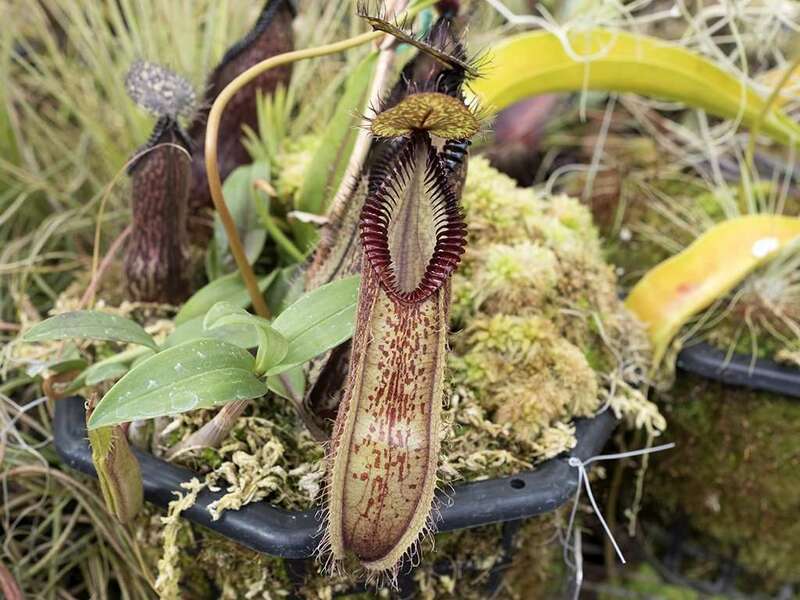 N. hamata is known to grow both as an epiphyte and terrestrially in moss-covered forests of the Indonesian island of Sulawesi. 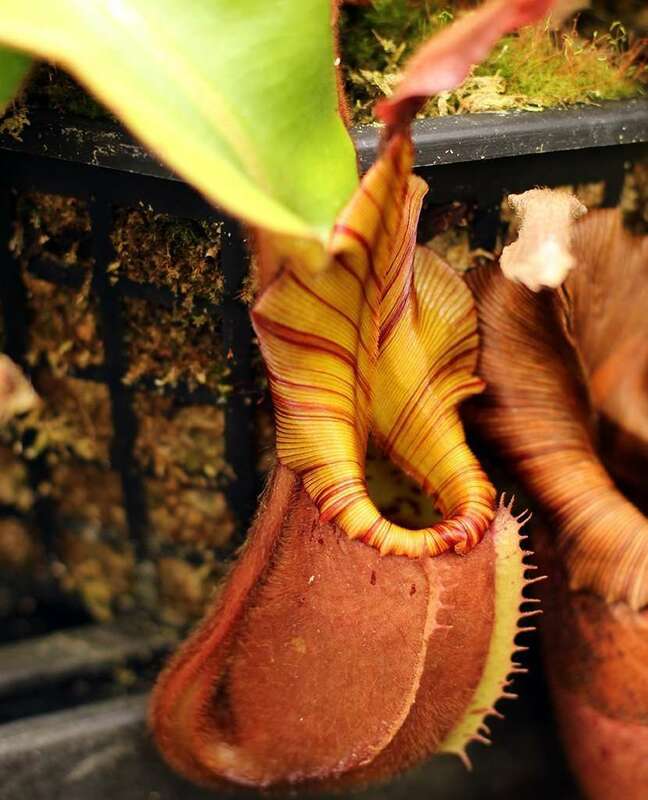 Humid, shady mountain ridges are its favored territory. 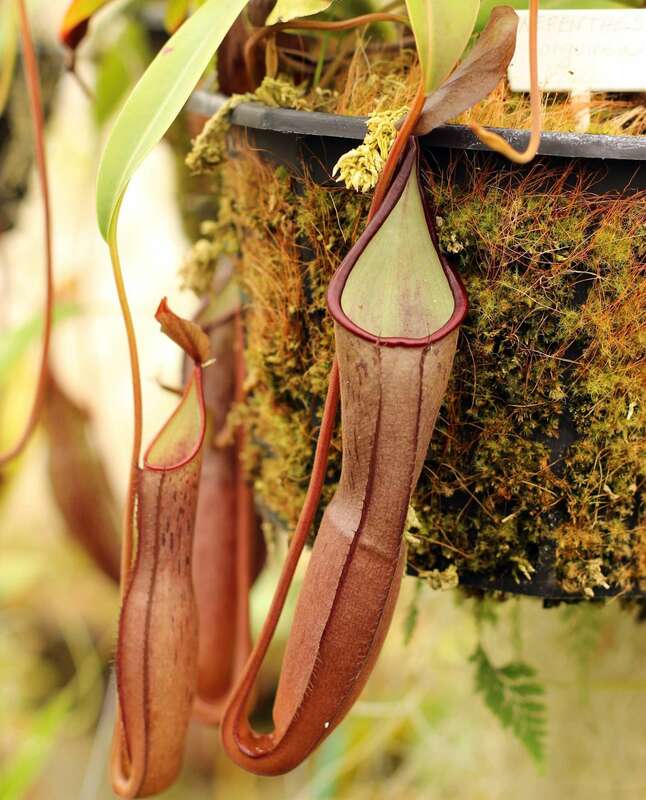 N. hamata is considered Vulnerable on the IUCN Red List, and is still somewhat of a rarity in private collections. 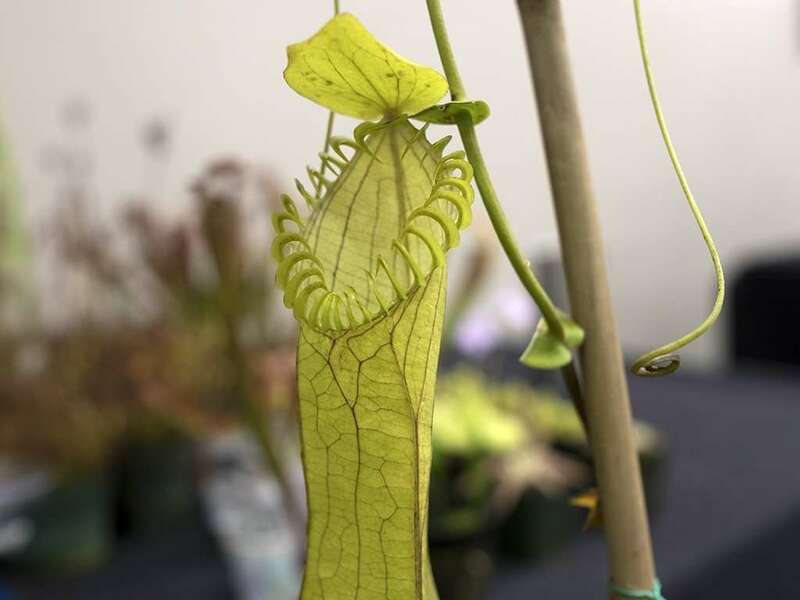 However, the plant has had a bit of a renaissance over the last decade as tissue culture helped increase germination rates on wild-collected seed.